‘There have been many attempts to define what it is that distinguishes man from the other animals. Man, it is said, is a tool maker; only man is capable of making music and song; man knows how to laugh; and so on. But amongst the most persuasive definitions of human distinctiveness and identity is surely that man commemorates. There are two basic and related ways in which this is achieved. One is through recording ‘history’, documenting events as they occur. 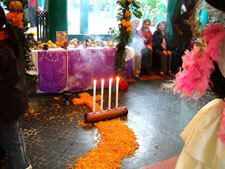 The other is through rituals of various kinds which lodge such events in ‘memory’. ‘In Mexico both have an important place. History was first recorded in painted scenes over 1,000 years ago on folded deerskin scrolls called ‘codices’. Events such as records of births and deaths, the recounting of genealogies, the annals of different rulers, their conquests and their attempts to defend their lands, are all portrayed. 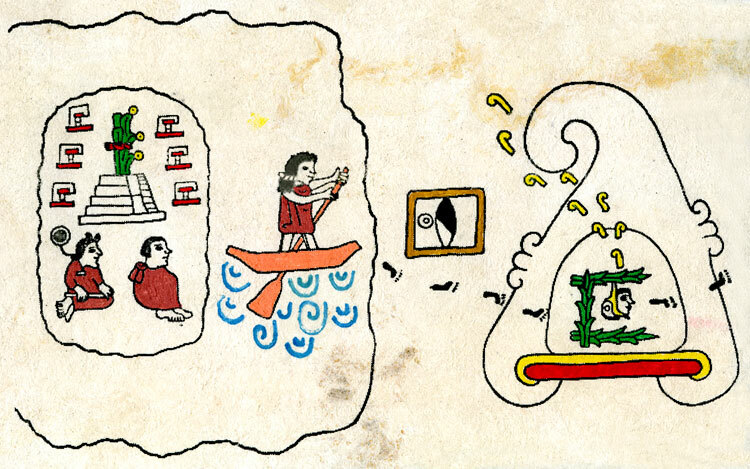 This gives vivid pictorial insight into the world of Mexico in the centuries before the Spanish Conquest, and what people then found it important to remember. ‘This accounting of the past is largely linear: one event succeeds another in a chronological sequence. However many ritual events are more circular in their approach. 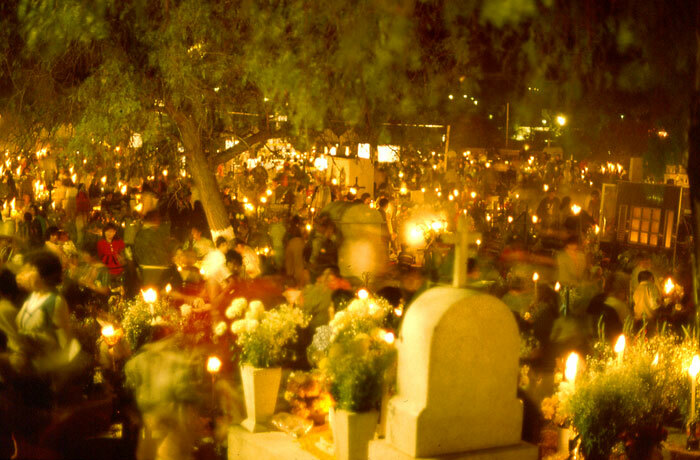 The celebration of the Day of the Dead, which occurs on All Saints’ Eve at the beginning of November each year is a major commemorative ceremony throughout Mexico. Its purpose is to celebrate, remember and, as much as anything, to entertain the dead. Sometimes roads of flowers are put in place to guide the dead from the graveyard to the house where their relatives will have constructed an altar dedicated to the most recently deceased and made ready an array of sugary foods and drink. ‘Many commemorative ceremonies are, by their very nature, sad and sombre: graveyards themselves are not joyous places. However, the Mexican Day of the Dead is anything but sober and cheerless. It is an effervescent event, full of zest and colour, an annual opportunity to remember and re-engage with relatives and friends who have passed on. 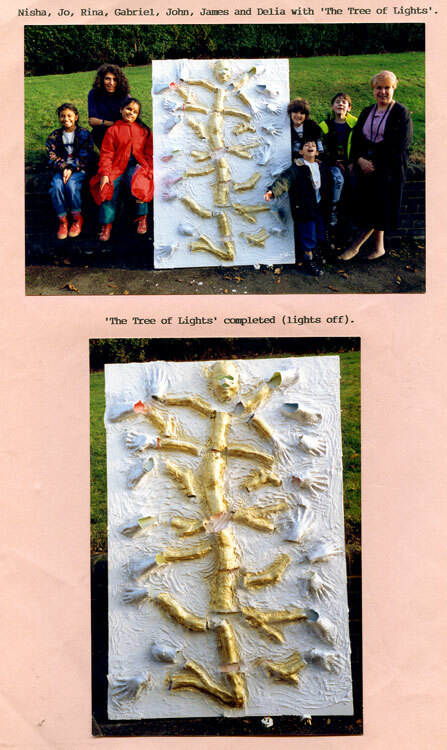 20 years ago the Day of the Dead was virtually unheard of in Britain. 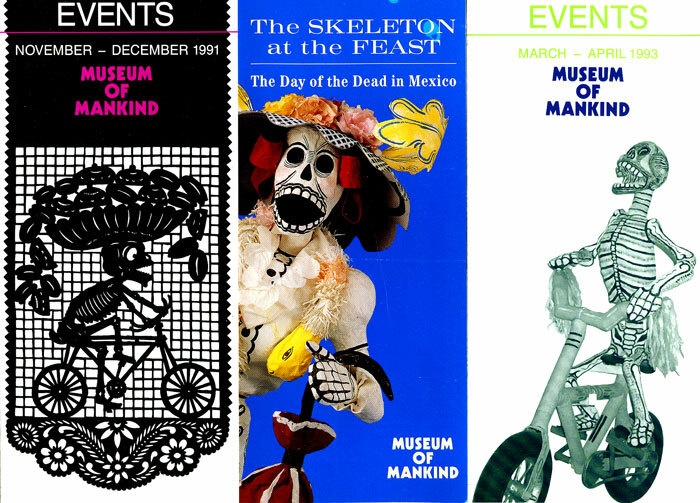 That began to change in the early 1990s when the largest ever exhibition on the festival outside Mexico was mounted in London at the Museum of Mankind. 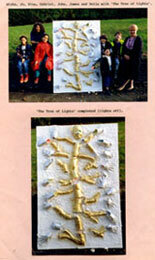 Called ‘The Skeleton at the Feast’ it was a truly ground-breaking 2-year ‘experience’ (1991-93). 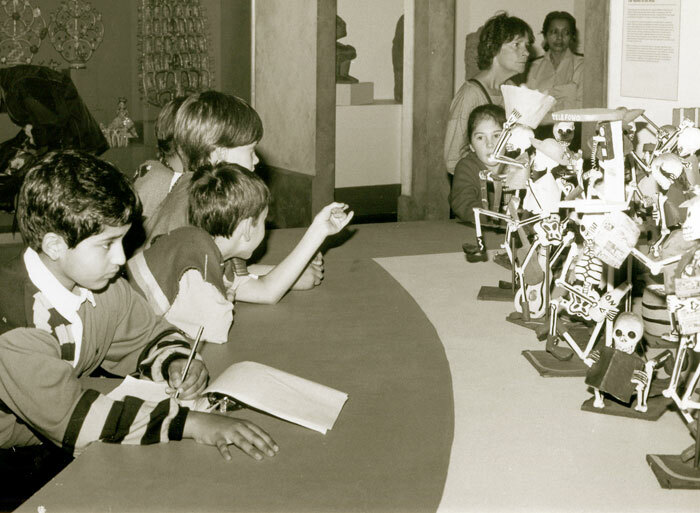 Young and old alike were captivated, amused and amazed by the realism, humour and creativity displayed so vividly in the hundreds of papier maché figurines seemingly frozen in time and space. 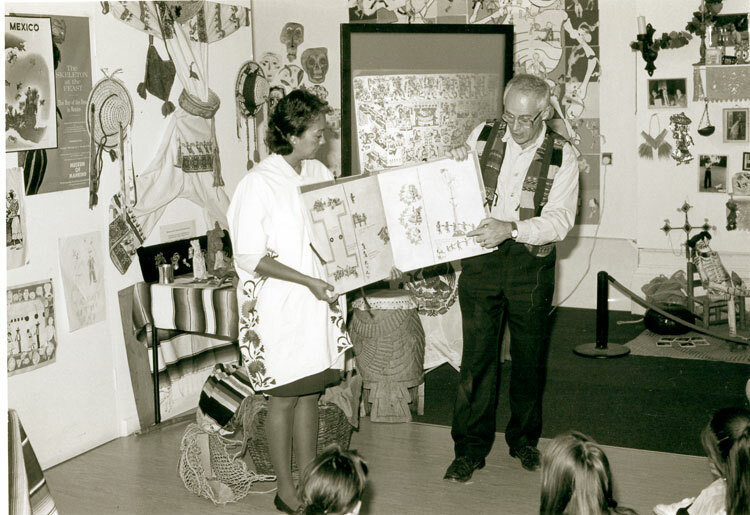 School groups flocked to the exhibition which inspired a veritable eruption of artistic creation, from simple paper/card cut-out skeleton figures (Pic 7) to highly imaginative works full of energy and spirit (pic 8). 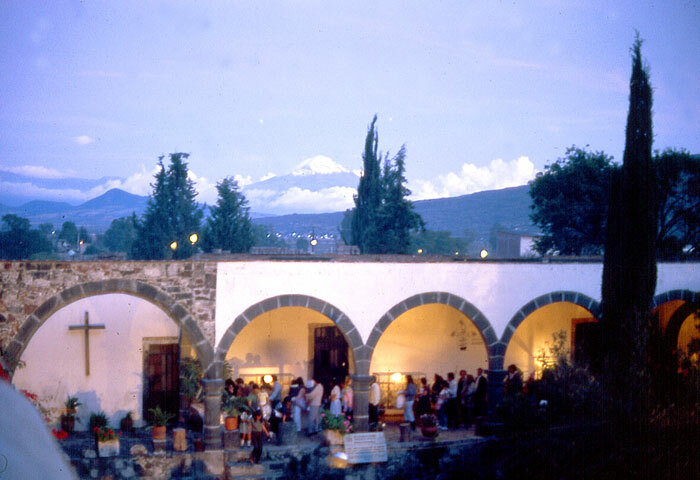 For the full two years the Mexicolore team worked full time at the Museum, running workshops every day for parties of school children. 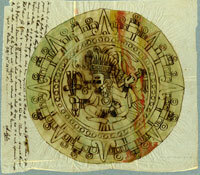 Each session began with a gentle introduction to Mexico and a look, via codices, at the influence of Mexico’s ancient past (Pic 9) - something we return to in detail in Part 2. 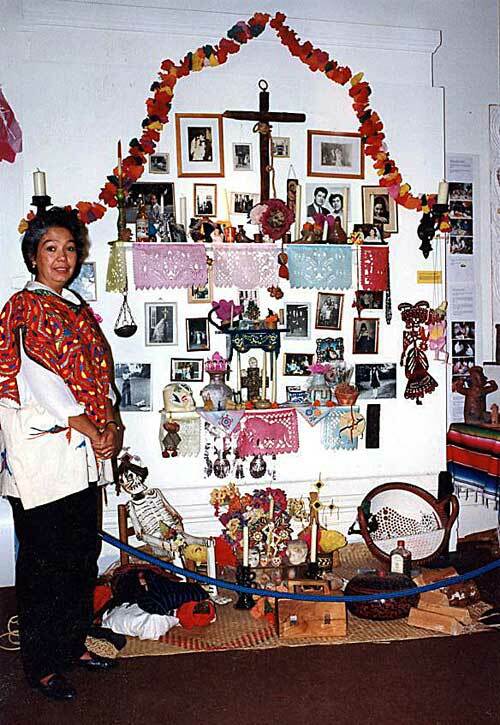 One of the centrepieces of ‘Room 6’ at the Museum (where the school workshops took place) was Graciela’s personal ‘ofrenda’, dedicated every year to her parents (Pic 10). 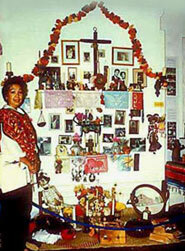 Some 15 years later she still regularly prepares a small ofrenda in primary schools studying life in Mexico today (Pic 11), which children help to decorate. 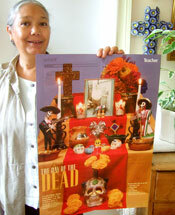 Mexicans living abroad have always kept alive the traditions of the Day of the Dead, preparing set-piece altars to coincide with the festival: contact any university’s Mexican Society (and there are close to 20 in the UK) and the chances are that they will be planning to celebrate the ‘Día de los Muertos’ in style. 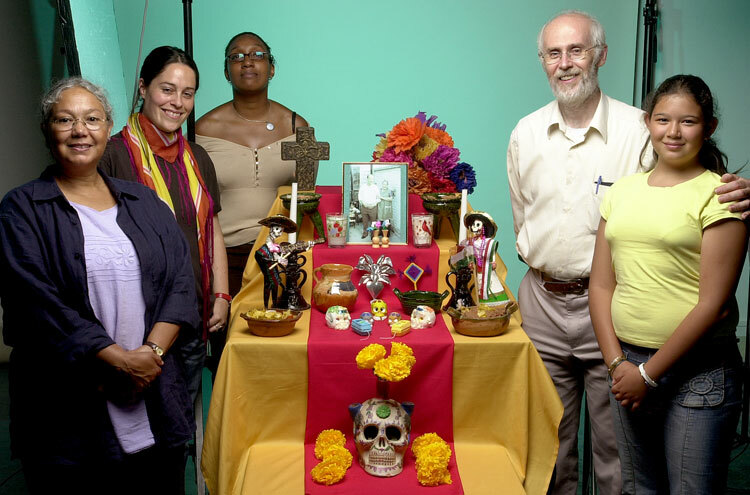 Today, teachers increasingly find the Mexican Day of the Dead a creative source of inspiration to satisfy the learning objective of ‘exploring the beliefs and customs of other cultures’. 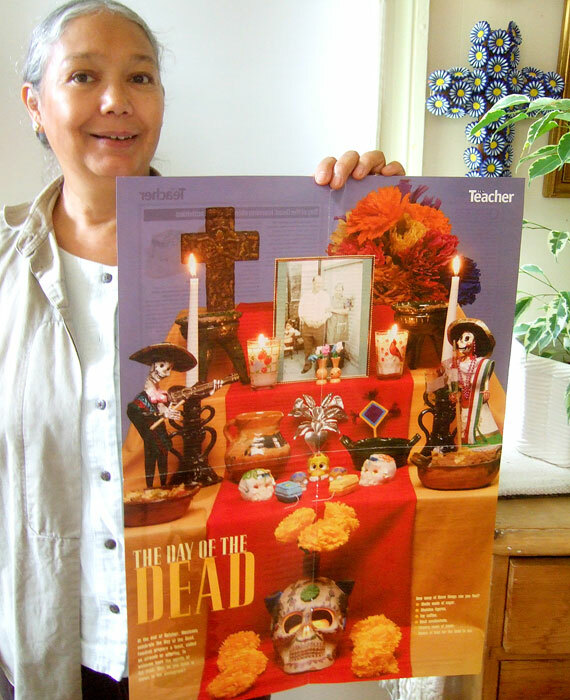 For their October 2005 issue Teacher magazine (the Primary section of the Times Educational Supplement) commissioned Mexicolore to create an A2 poster (Pic 12) which centred on a simplified version of Graciela’s family altar; on the reverse was a picture key, background information, useful links and resource ideas for schools, focusing on a class assembly. We’ll expand on these in Part 2. So what of the festival itself? Strictly we should refer to the DAYS of the Dead, as there are 2-3 of them, and they last every year from the afternoon of October 31st. into the night of November 2nd. The date coincides with Hallowe’en (celebrated in Europe and the US) and with All Saints’ (and All Souls’) Day. 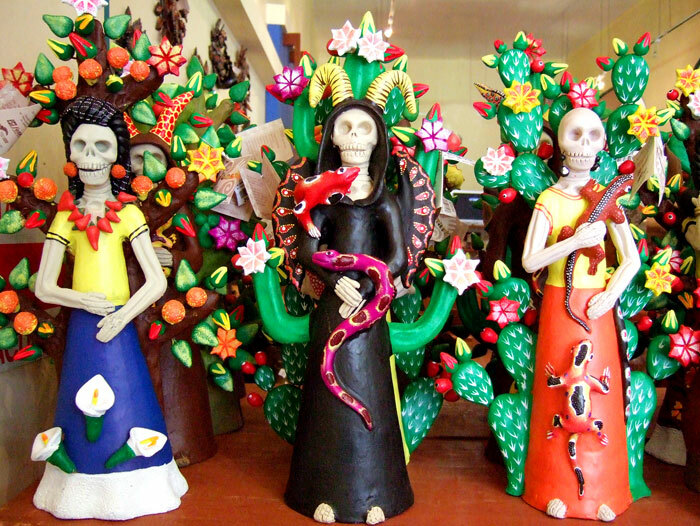 Far from being a morbid or spooky occasion, Mexicans have a healthy, positive, carefree, ironic approach to the subject of death and this is reflected in their great festival ‘El Día de los Muertos’, ‘Días de Muertos’ or just ‘Muertos’ for short. It’s a time of celebration as families come together to share memories of those loved ones who have died, and to welcome their spirits back to Earth and into their homes. 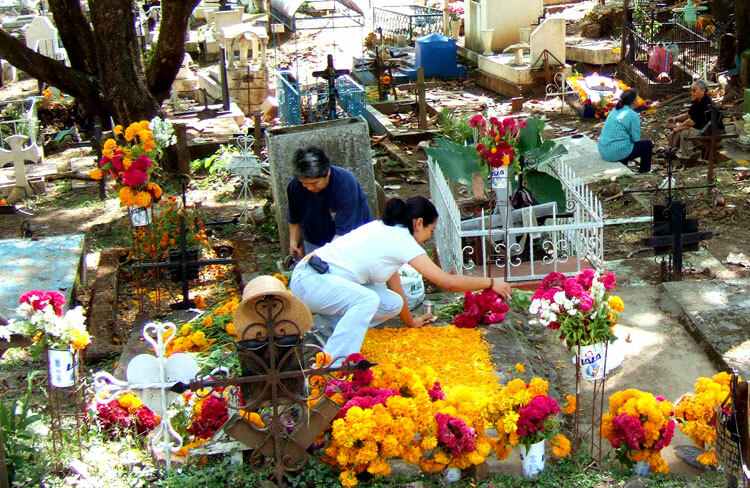 Since most people have fond memories of parents, grandparents, uncles, aunts, or sometimes younger relatives who have died, it’s hardly surprising that this festival is almost universally celebrated throughout Mexico. 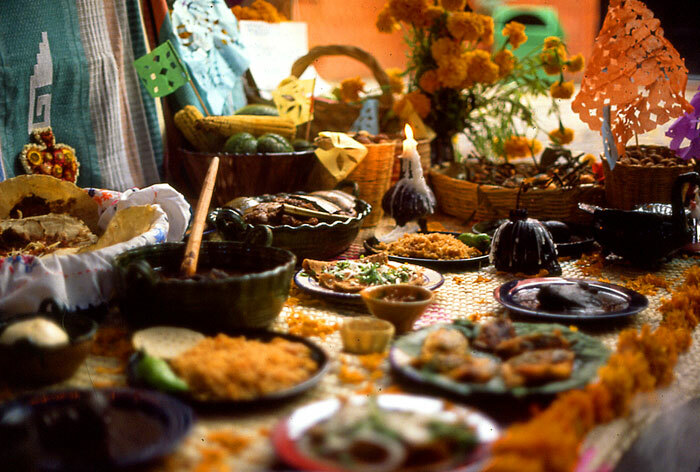 As with a birthday party, every family makes a big effort to prepare for the reunion - the more life, colour, music, dance, joy and food-related ‘goodies’ that can be provided the better. 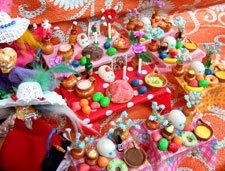 It is a veritable family ‘feast’, laid on every year especially for the dead, and it aims to appeal to all the senses: attracted by the sounds (from music to fireworks), lights (of candles), aromas (of foods, flowers and incense) and general festivity, the souls can come back to Earth to enjoy, however briefly, some of the pleasures they remember when they were alive. ...with ancient roots that go back to pre-Hispanic times. 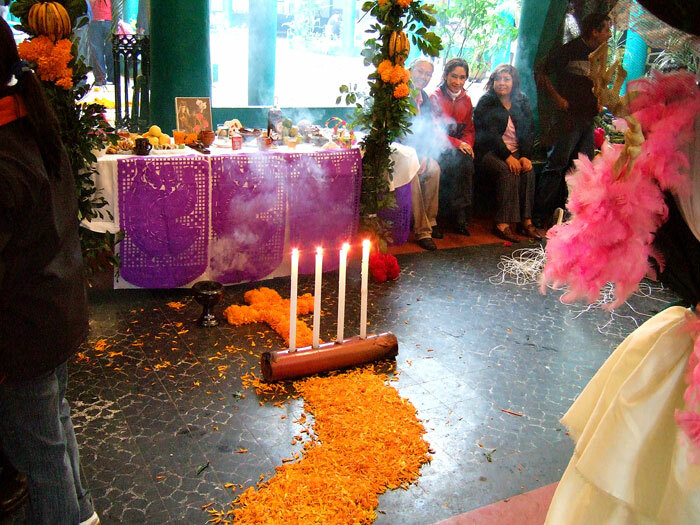 In small villages and towns throughout the land families still decorate their traditional household altars with much the same foods (such as tamales and hot chocolate) and flowers (such as the yellow marigold) that their Aztec (or Mixtec, Maya, Totonac...) ancestors did (Pic 18). Images of ancient gods may have been replaced with those of Christian saints, but deep down you sense that the Spanish never quite succeeded in eliminating customs that may actually have been older even than their ‘Old World’ equivalents. 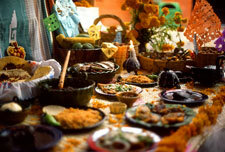 Family-centred feasts for the dead are an ancient tradition in many parts of the world, going back long before Christianity. 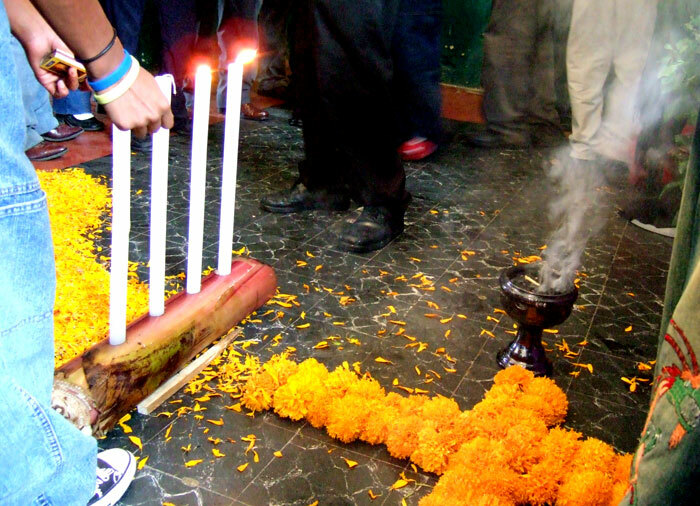 In Mexico, by tradition, the souls of dead children (‘angelitos’) return first, and October 31 is kept for welcoming them back to Earth; after they’ve left, the adult souls return on November 1. 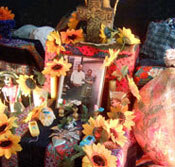 Everything is carefully arranged on the offering table, centred around the photographs of those who have died. You can’t see the returning spirits, you can’t talk to them (well, you can, but they never answer back! ), but Mexicans strongly believe - and sense - that they are most definitely there with them. 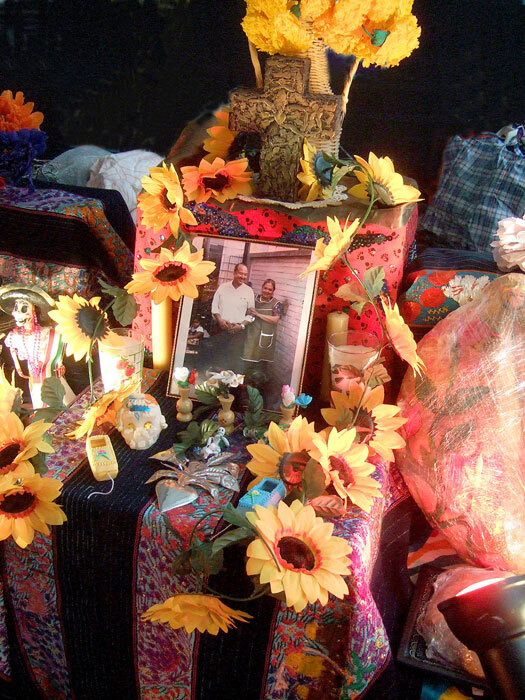 The festival may be family-centred but, unlike Christmas in modern Britain, the Day of the Dead is also a time to share with the wider community: families gather in their hundreds in cemeteries to decorate graves, leave further offerings, mourn (it’s a time for tears too) and join with neighbours and friends in sharing memories, dishes, drinks - perhaps a song or two - before they settle back into their ordinary, everyday routines. 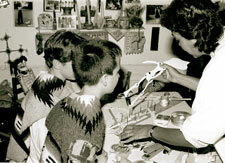 Being Mexican, it is nice to read that non-Mexican individuals become interested in our culture. Mexico is a diversed country within itself; but the Day of the Dead is solely celebrated on November 2. Yes, “los angelitos” come first, but not until November 1st. October 31st is the Allhallows or halloween celebration, which unfortunately many outsiders assimilate with the “el Dia de los Muertos” celebration (there’s no short name for this celebration, if you ask me). Although this is a very interesting article and I learned new things about the Aztecs, I’m also interested to know how Dr. Mack conducted his research to write this paper. From what I have researched about him, so far I have not seen anything indicative of his interest in Mesoamerican cultures. just wondering. 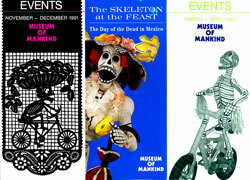 Mexicolore replies: A fair question, but you shouldn’t doubt John Mack’s qualifications in this field: John was Keeper of the Museum of Mankind during the iconic ‘Skeleton at the Feast’ exhibition, which lasted two years. 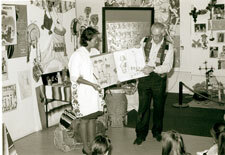 He worked very closely with Elizabeth Carmichael and Chloe Sayer, the two curators of the exhibition, with our Mexicolore teaching team, and with the long list of both academics and artisans from Mexico who took part in the educational support programme, and became immersed in the meaning and background of the Day of the Dead. This, coupled with his encyclopedic knowledge of world cultures generally, makes him very well qualified to write on this subject, and to put it into an international context - which he does both here and in his highly regarded book on memory in world cultures.